What Can We Learn from Starlight? How Will Climate Change Affect Health in the Bay Area? How Can Human Life be Sustained on Mars? How Would Life Adapt to Survive on Another Planet? How Would Life Adapt to Extreme Atmospheric Conditions? Is Earth Doomed To A Catastrophic Collision? How will Climate Change Affect the SF Bay Area? 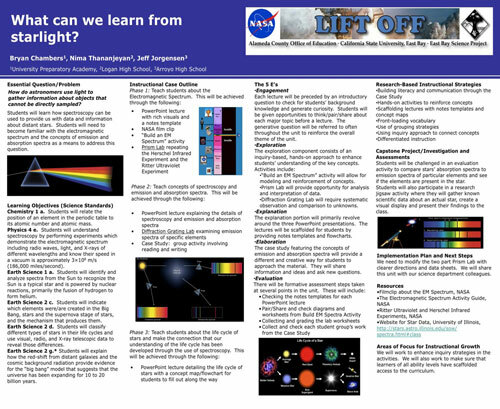 How do astronomers use light to gather information about objects that cannot be directly sampled? Students will learn how spectroscopy can be used to provide us with data and information about distant stars. Students will need to become familiar with the electromagnetic spectrum and the concepts of emission and absorption spectra as a means to address this question.